Goddard’s liquid-fuel rocket from May 1926. This rocket borrows parts from his earlier March 1926 rocket. This 1926 Goddard Rocket is being removed from its protective case in preparation for offsite travel. Cover of "A Method of Reaching Extreme Altitudes"
The cover of "A Method of Reaching Extreme Altitudes" by Robert Goddard. Goddard received funding for his research from the Smithsonian Institution, the resulting report from which is seen here. Goddard’s writings about the potential of rocket flight had greater influence than his technological innovations. Dr. Robert Hutchings Goddard (1882-1945) is considered the father of American rocketry. A theoretical scientist as well as a practical engineer, he held more than 200 patents, although he was reluctant to publicize his work during his lifetime. This drawing shows US Patent no. 1,102,653, issued July 7, 1914, for a rocket apparatus was awarded to Robert Hutchings Goddard. Goddard’s May 1926 rocket consisted of two tanks, one holding liquid oxygen, the other gasoline, feeding a rocket nozzle at the bottom—a configuration still used today. Goddard’s work demonstrated that liquid-fueled rockets were the best possible way to achieve space travel. 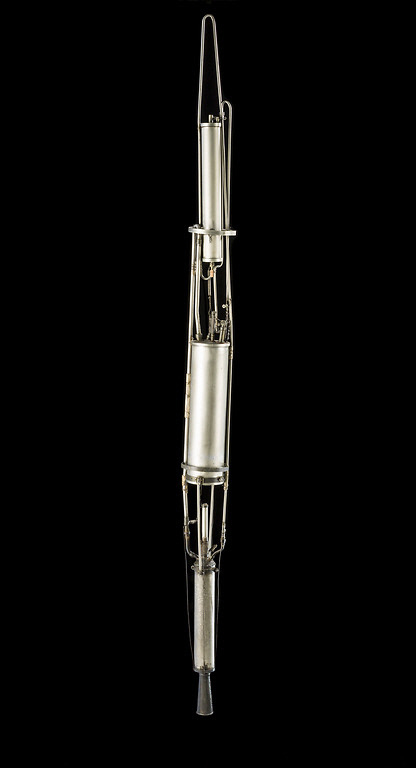 This device is the oldest surviving liquid-propellant rocket in the world. It was designed and built by U.S. rocket experimenter Robert H. Goddard in Worcester, Massachusetts. It was Goddard's first in which the motor was placed at the base, instead of in the nose. He had used the latter configuration on the world’s first liquid-propellant rocket to fly, which he launched on 16 March 1926. The May rocket likely includes the nozzle from that historic vehicle. His attempt to launch his new rocket on 4 and 5 May 1926 was not successful, as it did not have enough thrust to lift itself. 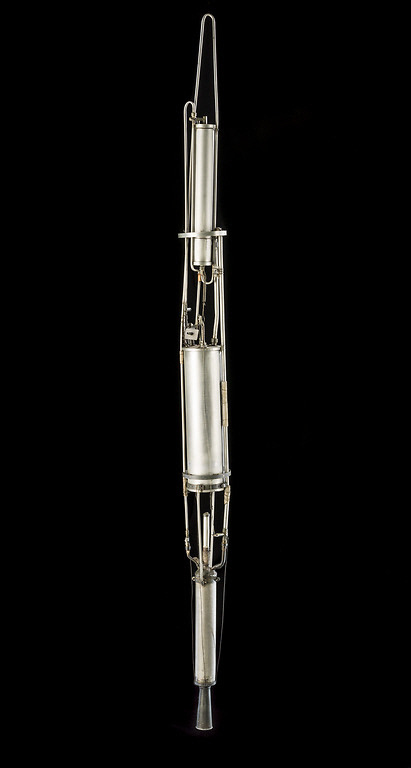 The Daniel and Florence Guggenheim Foundation for the Promotion of Aeronautics gave this rocket to the Smithsonian in 1950. In 1926 Robert Goddard conducted his first launches with liquid propellant rockets. Those tests, done on a relative’s farm near Auburn, Massachusetts, demonstrated that liquid-fueled rockets could potentially reach much higher altitudes than gunpowder-based rockets. This rocket, tested in May, is the oldest liquid-fueled rocket in existence. The May rocket also probably includes parts salvaged from the rocket launched on March 16—the world’s first flight of a liquid-fueled rocket.